Pattern Description:Close fitting knit top with a cowl neck and fluttery sleeves. Pattern Sizing: 8-18. I made an 8. Did it look like the photo/drawing on the pattern envelope once you were done sewing? I sewed View A without the bottom tie, and yes, it looks just like the drawing. Were the instructions easy to follow? This is my second time making this top. 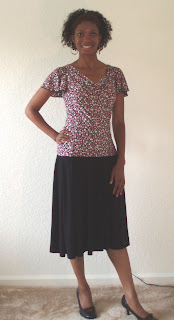 There are only three pattern pieces (front, back, sleeves), and it goes together super fast. The first shirt I made I used French seams. The new shirt I used my serger and rolled hemmed the sleeves. What did you particularly like or dislike about the pattern? There is nothing to dislike about this pattern. I love the close fit, the flirtly neckline, and the fun sleeves. Fabric Used: Black/gray/pink floral print jersey from Gorgeous Fabrics. Pattern Alterations or any design changes you made: I omitted the bottom tie. Would you sew it again? Would you recommend it to others? I’ve already sewn this view twice, and I’ve also made views B and D. I would highly recommend this pattern because it is quick, simple, and stylish. Conclusion: I love this top. It’s sooo easy and very cute. Oooh, how pretty and feminine! You look fabulous. Great job! Hi, everyone! I’m glad to be back. And Gold, no, I did not make the skirt. I got it from J.C. Penney’s on sale; it’s one of my favorites! It’s good to see you back Pirouette! Your outfit is beautiful, and so are you! Very cute top and it looks great on you!! The skirt is cute also did you make that too? You look great in the clothes you make! This is such a wonderful top, it looks great on you. I really like the neckline, too. And I love the fabric you used lol. Very cute!!! I picked this pattern up a couple weeks ago!! I love how yours came out!